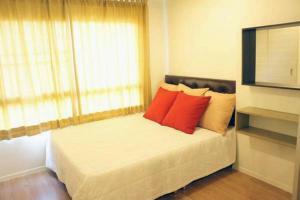 Airport Link Hua Mak Condo - Bang Kapi, Bangkok, Thailand - Great discounted rates! Airport Link Hua Mak Condo is conveniently located in the popular Bang Kapi area. The property has everything you need for a comfortable stay. Service-minded staff will welcome and guide you at Airport Link Hua Mak Condo. Guestrooms are designed to provide an optimal level of comfort with welcoming decor and some offering convenient amenities like flat screen television, private entrance, sofa, towels, closet. The property offers various recreational opportunities. Airport Link Hua Mak Condo combines warm hospitality with a lovely ambiance to make your stay in Bangkok unforgettable.